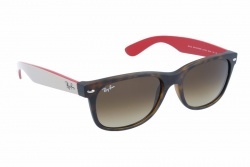 New Wayfarer design comes from a reinterpretation of the classic Original Wayfarer sunglasses that meant a revolution because of their retro frame made of plastic or first-quality acetate. New wayfarer sunglasses feature a smaller design. They’re retro-style but they’re a modern design, and they’re still one of Ray-Ban’s most popular models. With the iconic classic Wayfarer as a starting point, New Wayfarer sunglasses edition presents an updated design, with a smaller frame and softer front lines. You can choose classic black frames with a large selection of lens coatings, such as green lens, double gradient, G-15 polarized or mirrored. 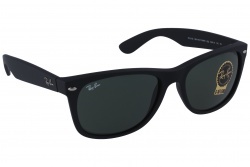 All Ray-Ban New Wayfarer Classic sunglasses have been designed to offer easy adjustment, sharp vision and great protection. 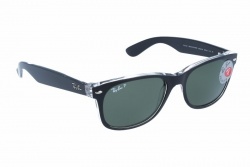 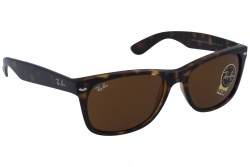 Ray-Ban New Wayfarer sunglasses are the perfect blend of quality and design. Materials used in their manufacturing process ensure exceptional protection against sun radiation, and also they make of this model the perfect accessory. 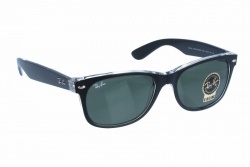 New Wayfarer sunglasses have been linked to celebrities such as Buddy Holly, J.F. Kennedy, Bob Dylan or Tom Cruise, and they’ve been spotted in movies and TV series such as Blue Brothers or Miami Vice. Ray-Ban New Wayfarer distinctive style have turned them into a fashion icon.